Sometimes, business owners fall into the trap thinking that that brand new website they just developed is the answer to all their problems. They can just start a lead generation campaign, point the traffic to the home page and wait for the leads to come in. Sometimes the traffic converts, sometimes they don’t. Here are some reasons why that beautiful new website of yours stink at converting traffic. Message match refers to how well the copy of your landing page (the page that your ad points to) matches with your ad copy. A strong message match increases conversions because they reinforce your visitor’s belief that they have come to the right place to solve their problems. When you created your brand new website, you weren’t concerned with how well your website copy matches your (as of then non-existent) PPC ad copy. So when you do run your lead generation campaign, you need to figure either ensure that your PPC ad copy matches your website copy, or change your website copy to match your PPC ad copy. Most companies don’t bother doing this. If you’re a large or bureaucratic company (I’ve seen levels of bureaucracy in small companies that can put any MNC to shame), then changing any copy on your website requires several levels of approvals and can be quite a headache. But the copy on your website (especially the headline) is usually not persuasive or strong enough to convert visitors. This is because most website copy is written for a general audience and is corporate in nature. They do not have the emotional appeals, credibility or urgency that does so well to convert visitors. So what happens is that the ad copy will have one appeal or promise, while the website copy will have another. This message mismatch will cause your conversions to decrease. As we have mentioned, the copy on most websites is very ‘corporate’ in nature. They use dry, over-used business words that don’t mean anything. Every technology or web hosting firm will be innovative and environmentally-friendly. A service-based business will say it values customer service more than life itself. A theme park is so exciting that your heart will stop. These are so overused that they don’t mean anything anymore. When people click on PPC ads, whether they are AdWords or Bing or Facebook, there’s a good chance that they are looking for a solution to solve their problem. 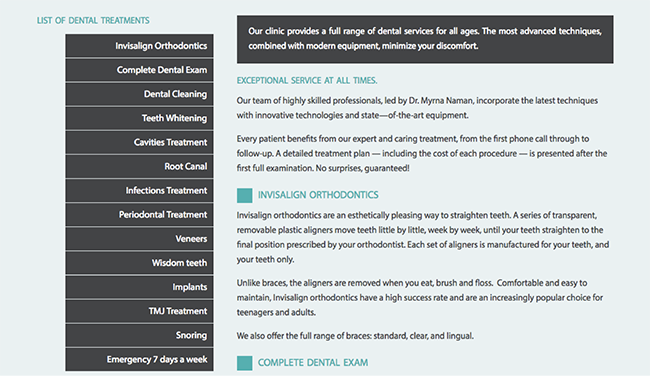 This page below is looks just fine for the services page for a dentist’s website. I’m sure you see the same type of services page fairly often. The problem was that it wasn’t converting very well. 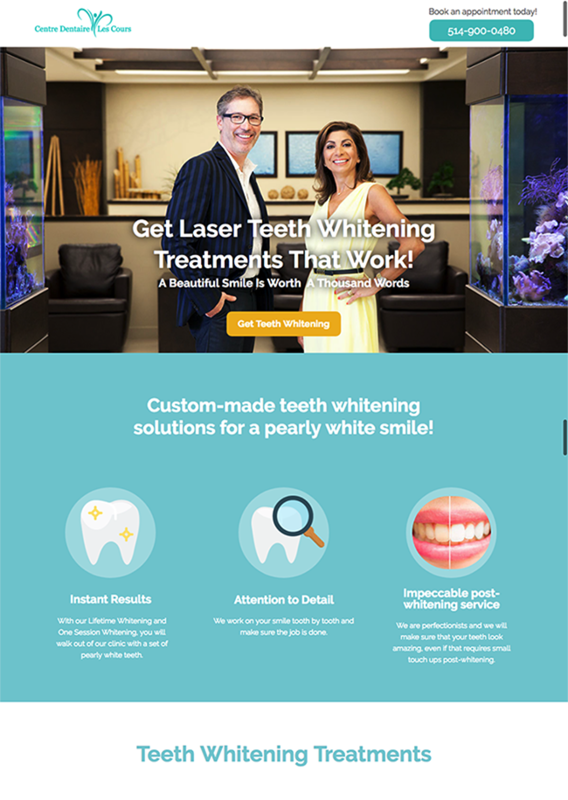 If let’s say, you clicked on an ad for a teeth whitening service, you do not want to suddenly find yourself having to navigate that services page. You want to see a page like the one below. By necessity, a website will have many pages, a navigation bar, links to your products and services, a write-up about your culture and so on. Your visitors tend to get distracted if you drop them on a page with links to many other pages. When you’re paying for traffic, you want that traffic to convert to leads. One of the best ways to do that is to remove every other link or call-to-action on a page other than what you want them to do. The longer your contact form, the less conversions you will receive. It’s a trade-off – you will get more leads if you use a shorter form. However, the longer the form, the more qualified your leads will be. In most cases, we would still recommend using a shorter form to increase conversions. Qualification can be done later but the most important thing is to start a conversation first. People are impatient. No matter how much you paid for their click, they are not going to hang around waiting for your website too load. They’re going to leave. They are not only going to leave your website, but they are also not going to come back. Check your page load speed to ensure that it’s acceptable. They are many tools such as Pingdom and Google Page Speed Insights that you can use. A slow website is also bad for your search engine optimisation efforts. According to David Ogilvy, “When you have written your headline, you have spent 80 cents out of your dollar.” 80% more people read the headlines than the body copy. They decide whether to continue reading your body copy based on the promise given by your headline. If your headline falls flat, appears weak or unbelievable or is irrelevant, your visitors are not going to read the rest of the page. If they are not going to continue reading, then they are not going to send an enquiry. Companies such as Upworthy and Buzzfeed religiously split test their headlines because they know exactly how important it is. This is an amateur problem that we still see from time to time. Your website doesn’t have a call-to-action that tells visitors what you want them to do. Do you want them to download your latest e-book? Submit an enquiry? Buy a product that’s on sale? You have to tell them! Do you need help figuring out why your brand new website isn’t getting you the customers you were hoping it would? Schedule a call and let’s see if we’re a good fit. Lai Imm is a community manager at CloudRock Sdn Bhd. She frequently writes about social media-related topics.